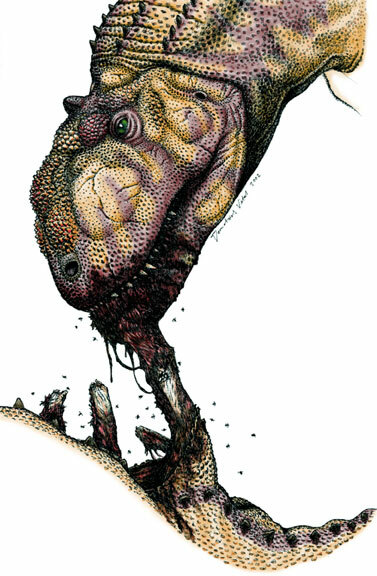 On Wednesday 6th July we’re pleased to welcome back palaeontologist, lecturer and writer Dr David Hone, who will be sifting the facts from the fiction about everyone’s favourite dinosaur – Tyrannosaurus. Dave is a lecturer at Queen Mary University of London, writer for the Guardian and author of the recently published Tyrannosaur Chronicles. He’s worked on dinosaurs and pterosaurs all over the world and is a great proponent of scientists engaging the public with their work – especially when it comes to how we know what we we know and how that changes with new evidence. So unleash that 7 year old inside and revel in the terrified joy that only a gigantic, prehistoric, meat-eating monster can bring and join us upstairs at the Old King’s Head, near London Bridge station. Doors open at 6pm for a 7pm start and as usual the event is free, but we will have a whip-round to cover costs – we hope to see you there!